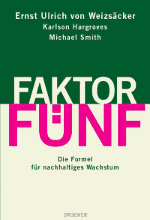 The successor to “Factor Four” (first published in 1997) has been published by Earthscan in December. Picking up where Factor Four left off, this new book examines the past 15 years of innovation in industry, technical innovation and policy. 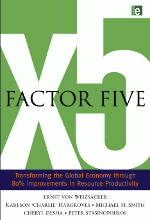 It shows how and where factor four gains have been made and how we can achieve greater factor five or 80%+ improvements in resource and energy productivity and how to roll them out on a global scale to retool our economic system, massively boost wealth for billions of people around the world and help solve the climate change crises. Spanning dozens of countries including China and India and examining innumerable cases of innovation in design, technology and policy, the authors leave no engineering and economic stone unturned in their quest for excellence. The book tackles sustainable development and climate change by providing in depth Factor 5 resource productivity studies of the following sectors: Buildings, Industry, Agriculture, Food and Hospitality, and Transportation. In its systematic approach to demonstrating how Factor 5 can be achieved, the book also provides an overview of energy/water nexus and energy/materials nexus efficiency opportunities across these sectors. Given that these sectors are responsible for virtually all energy usage and greenhouse gas emissions globally, this book is designed to guide everyone from individual households, businesses, industry sector groups to national governments in their efforts to achieve the IPCC recommended target of 80 per cent reductions to greenhouse gas emissions. It also looks at innovation in regulation to increase resource productivity, pricing, carbon trading, eco-taxation and permits and the role of international institutions and trade. The authors also explain exciting new concepts such as bio-mimicry and whole system design, as hallmarks for a new generation of technologies. The last part of the book explores transformative ideas such as a long term trajectory of gently rising energy and resource prices, and new concepts of well-being in a more equitable world. To receive a 20% discount when ordering online at routledge.com, please enter the voucher code AF20. This entry was posted in Factor Four / Factor Five, Notes and tagged Energy Efficiency, Energy Productivity, Energy Saving, Resource Efficiency, Resource Productivity, Sustainable Development on 7. January 2010 by Ernst Ulrich von Weizsäcker.